Wool is an excellent choice when it comes to bedding. The wool fibres regulate body temperature while you sleep, affording you a consistently good night's sleep at an optimum temperature. If sharing a bed, the fibres adapt to each individuals body temperature. It provides comfort all year round. 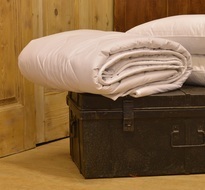 Click here for more info on Wool Bedding.